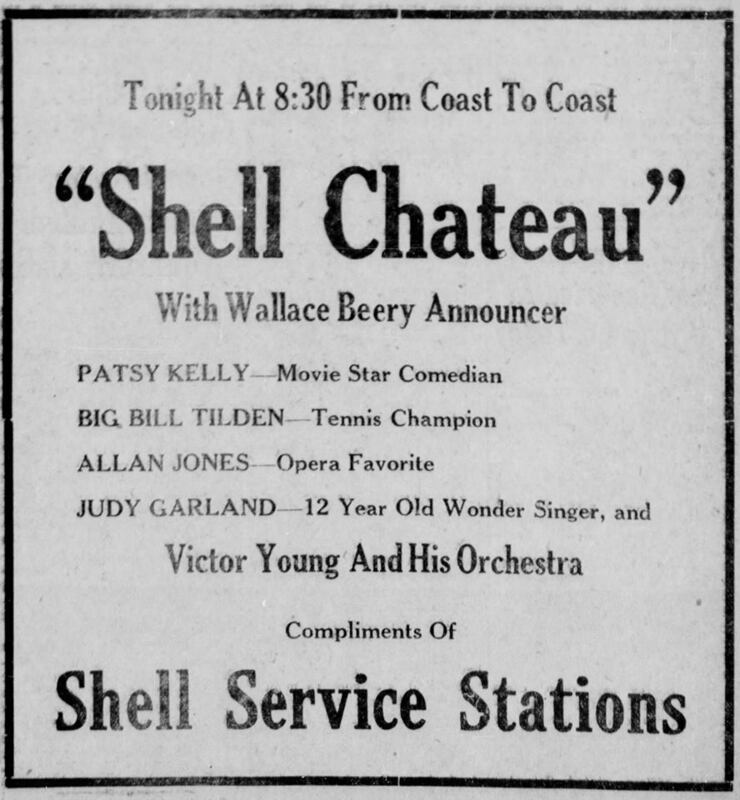 November 16, 1935: Judy’s return to the “Shell Chateau Hour” broadcast live from the KFI Studios in Los Angeles, over NBC Radio, from 6:30 – 7:30 p.m. She’s billed as a “12 Year Old Wonder Singer” even though she was well past her 13th birthday. 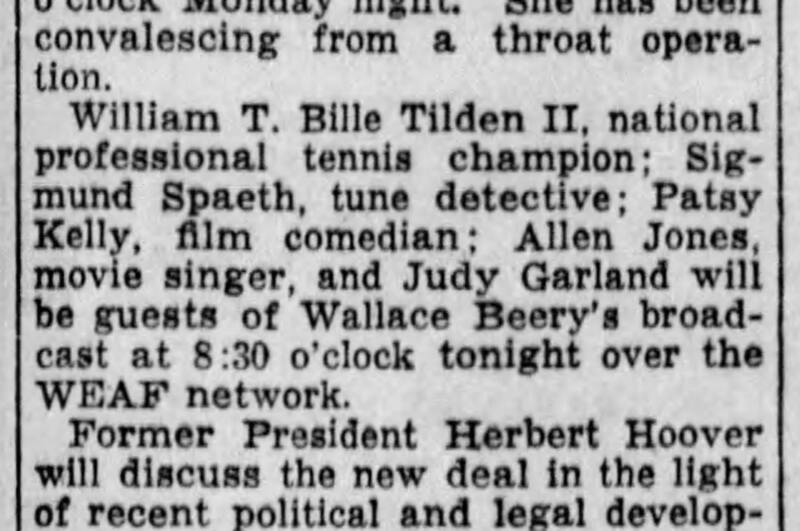 Host Wallace Beery makes note that Judy has been signed by MGM – making it seem that she had been signed since her first appearance on the show (when in fact she signed with MGM a few months earlier and prior to any appearances on this program). He also said that Sam Katz wrote her into his new picture, “Yours and Mine,” “the minute” Judy was signed. Judy never appeared in the film. This performance is especially noteworthy in Judy’s life – and we’re lucky to have it. It’s the earliest known recording of a song she would sing throughout her career (in varying arrangements) as well as being the song that she sang at her audition for MGM. 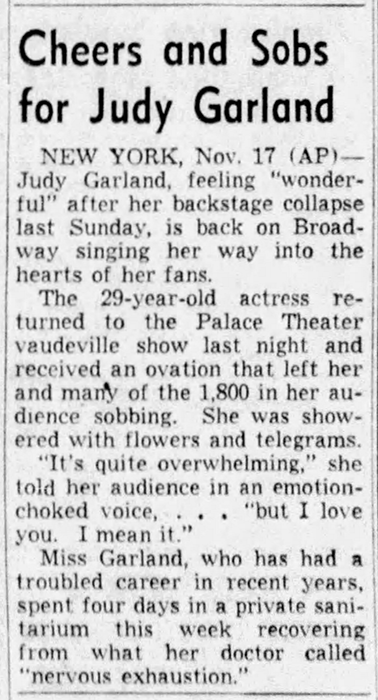 Of note is the fact that after this performance Judy did not go directly to the hospital. MGM had her sing at the La Monica Ballroom in Santa Monica, as part of the “MGM Club Dance” directly after this broadcast and before she was allowed to go to the hospital. 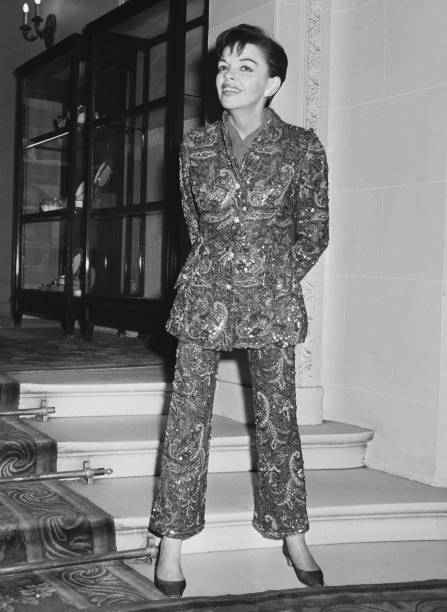 Note that Judy’s seen in this on-set shot wearing her booties. 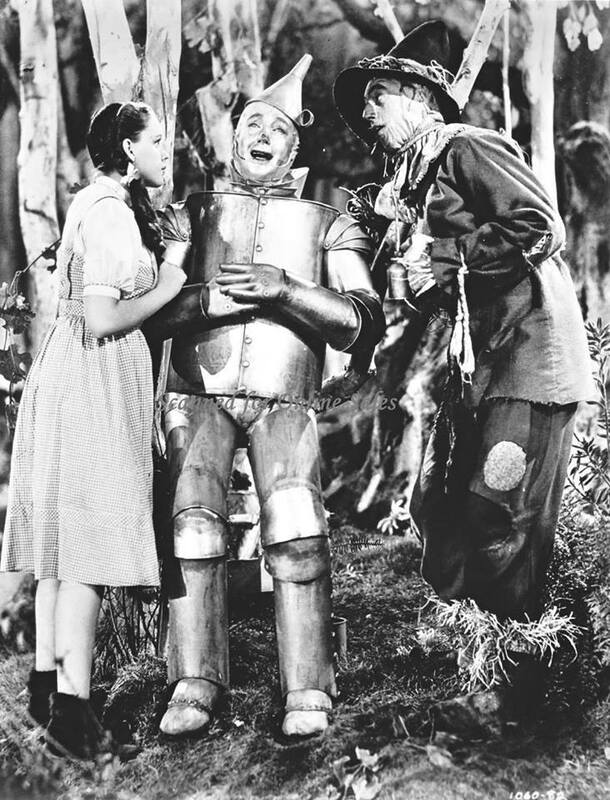 She did not wear the Ruby Slippers in shots in which they were not seen. This was to keep them from getting too worn out and it also helped her appear smaller than her companions, and thus more childlike. 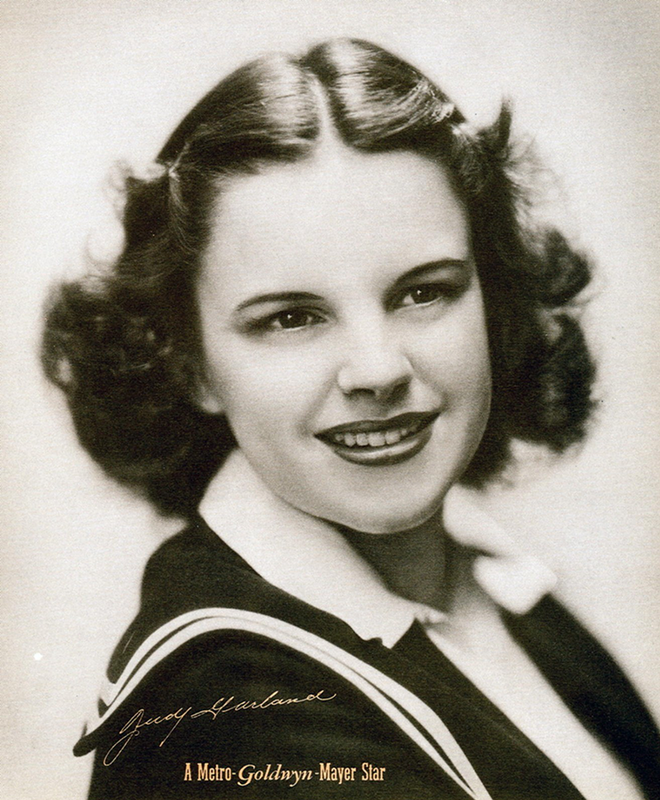 November 16, 1943: Judy had rehearsals of “The Trolley Song” and “Skip To My Lou” for Meet Me In St. Louis. Time called: 11:30 a.m.; dismissed: 4:50 p.m. Image provided by Kim Lundgreen. Thanks, Kim! 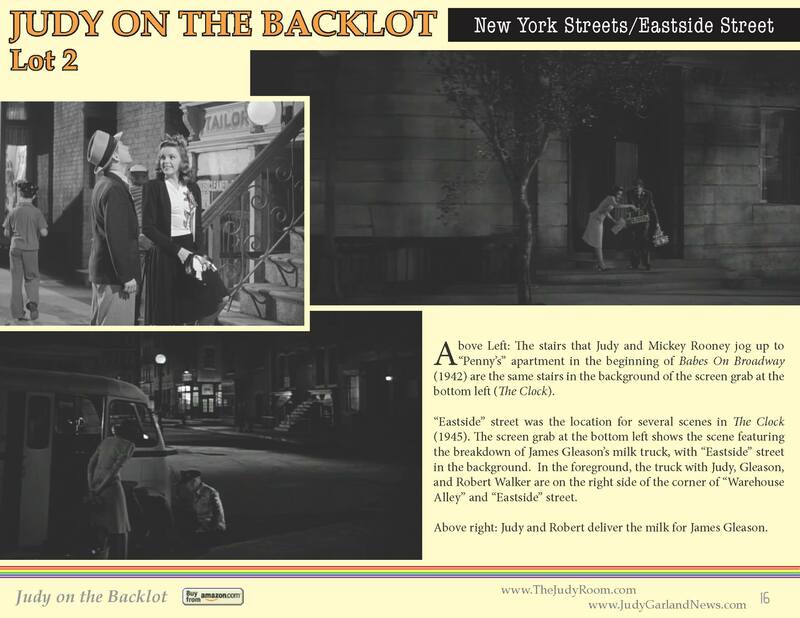 November 16, 1944: The Clock filming continued on the “Exterior NY Street-Flat Tire” set which was actually the “New York Streets” section of MGM’s Backlot #2. Time called: 10 a.m.; dismissed: 6 p.m.
November 16, 1946: The Decca Records compilation album, “Christmastime,” was in stores. 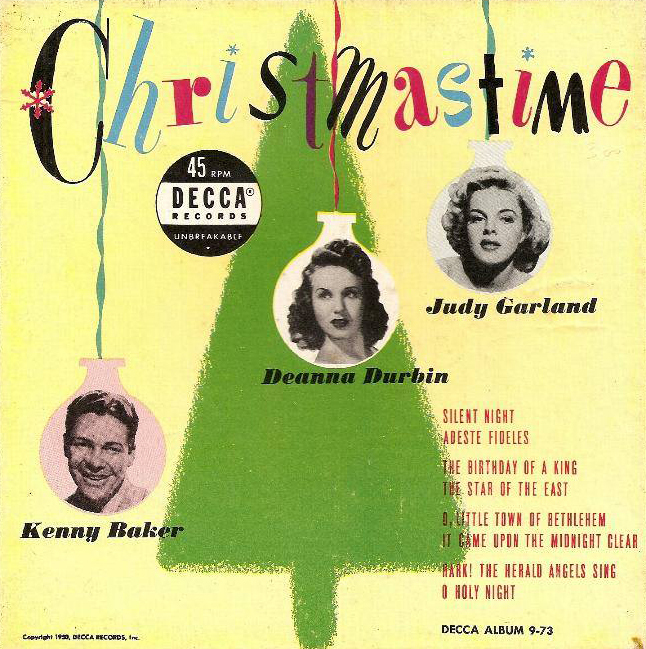 It’s the very first time that Judy appeared on a holiday-themed album. As we know she never recorded an actual holiday album although the holiday songs she recorded over the years have since been included in several compilations. This particular release was available first in the 78rpm album format in November 1946, and then in 7″ 45rpm format in 1950. 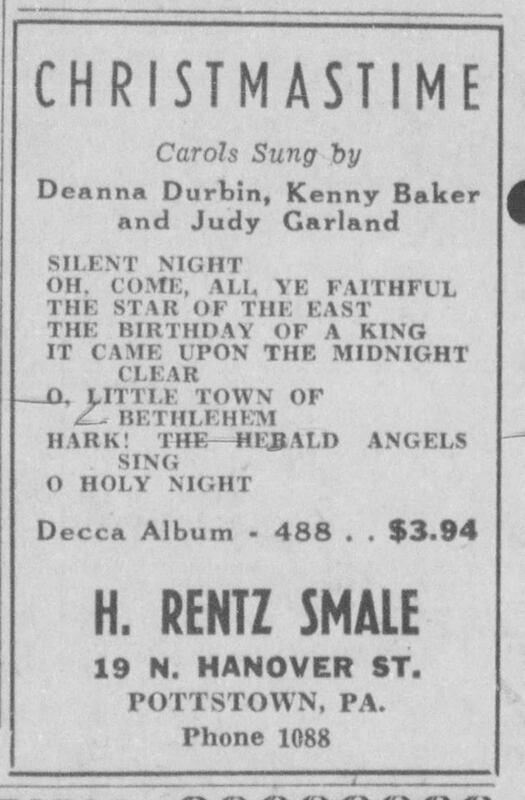 The Garland tracks included were “The Birthday Of A King” and “The Star Of The East” both recorded on July 7, 1941. 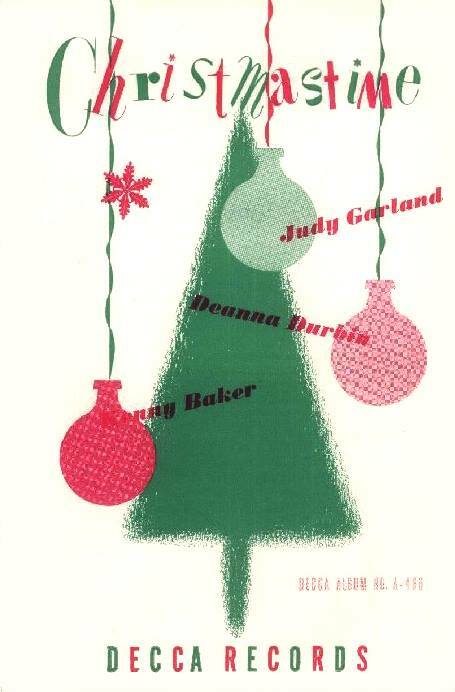 Check out The Judy Garland Online Discography’s pages on “Christmastime” for more details. 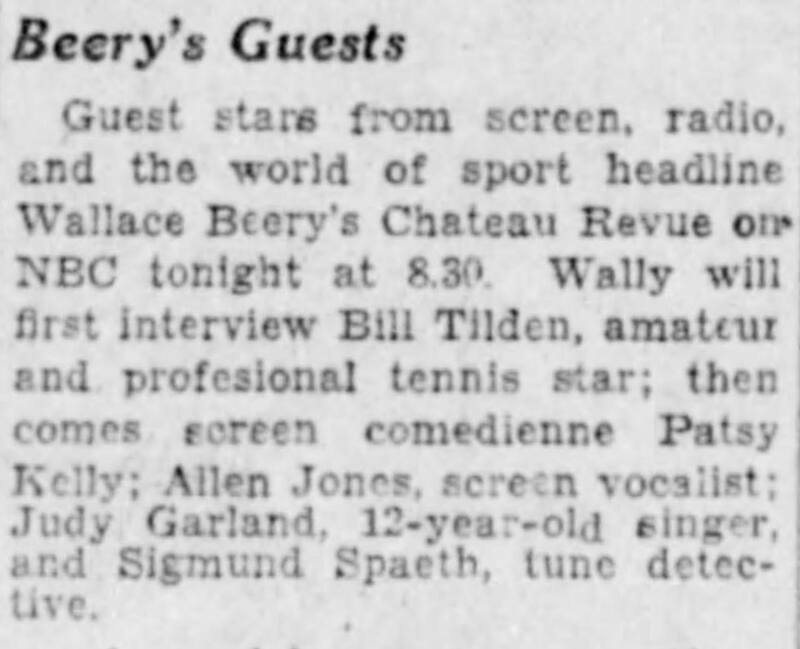 November 16, 1948: I bet this was incredibly fun to watch! Too bad it wasn’t filmed, or maybe one or more of the parents had home movie cameras? MORE THAN 1,500 PERSONS saw these youngsters in Mrs. Kelly Grogan’s third grade at Central break out in a rhythmic rendition of “We’re a Couple of Swells” at the PTC Carnival Thursday. The children were dressing in dilapidated evening clothes which were decorated with various-closed patches. 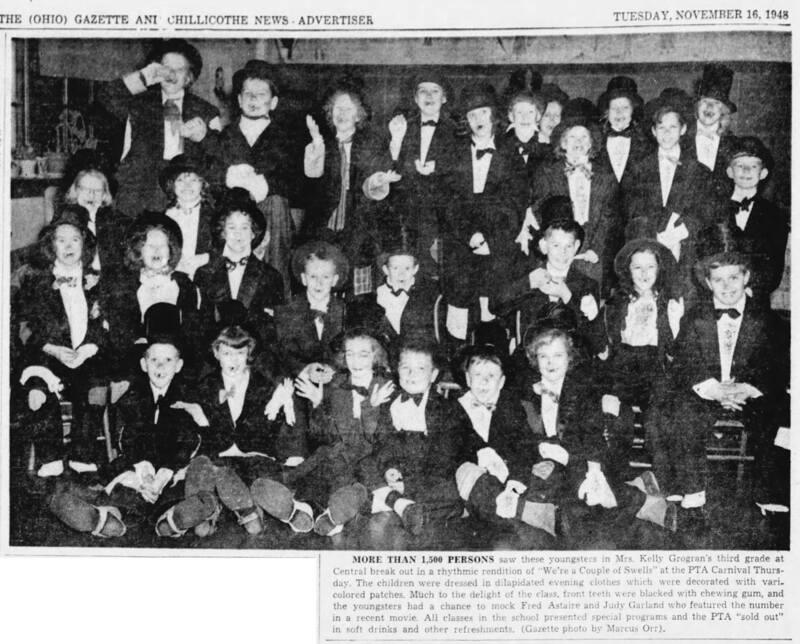 Much to the delight of the class, front teeth were blacked out with chewing gum, and the Youngers had a chance to mock Fred Astaire and Judy Garland who featured the number in a recent movie. All classes in the school presented special programs and the PTA “sold out” in soft drinks and other refreshments. (Gazette photo by Marcus Orr). 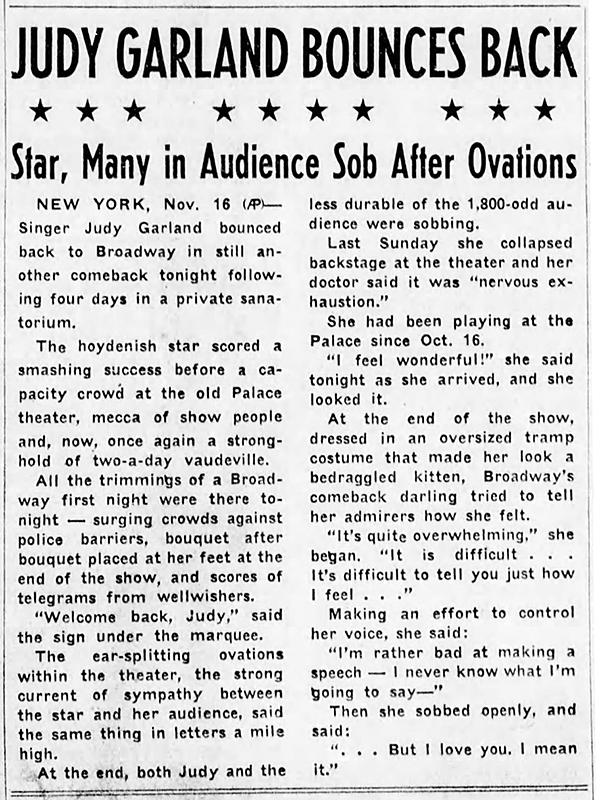 November 16, 1948: A very productive day for Judy on MGM’s famous recording stage. She pre-recorded “Merry Christmas”; “Meet Me Tonight In Dreamland”; “Put Your Arms Around Me, Honey” (Van Johnson’s opening vocal was pre-recorded the next day, November 17, 1948), and “Last Night When We Were Young” for the film In The Good Old Summertime. Each song was completed in three takes or less. The latter was deleted from the film prior to its release. 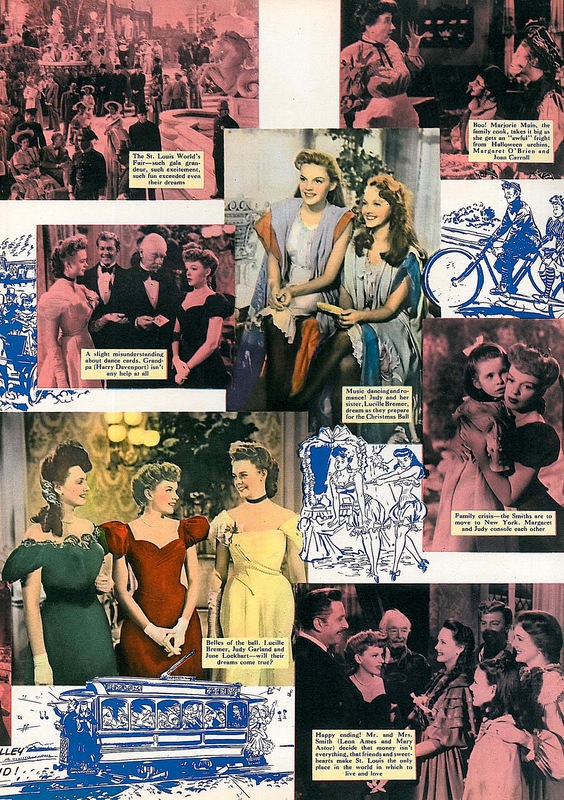 Although MGM Records released an album of songs from the film in 1949, both “Merry Christmas” and “Last Night When We Were Young” were not included. That album was actually not an “album” but a “gatefold” with two records containing just four songs from the film. See image above, and the opened up gatefold below. 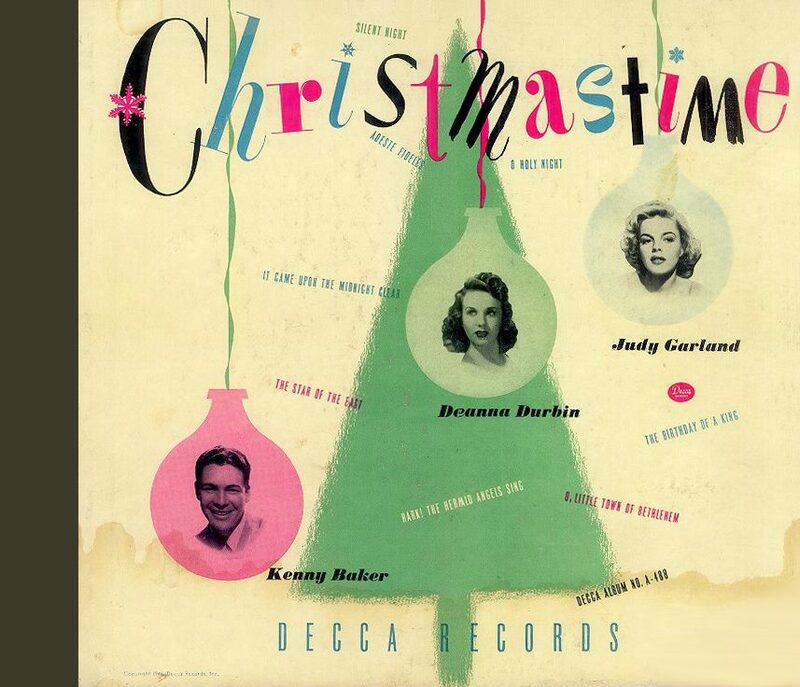 “Last Night When We Were Young” first appeared on the 1951 compilation “Judy Garland Sings” and “Merry Christmas” first appeared on 1952’s compilation “Merry Christmas.” All of the songs would not appear together as a “complete” soundtrack until 1974’s “Those Glorious MGM Musicals” series. 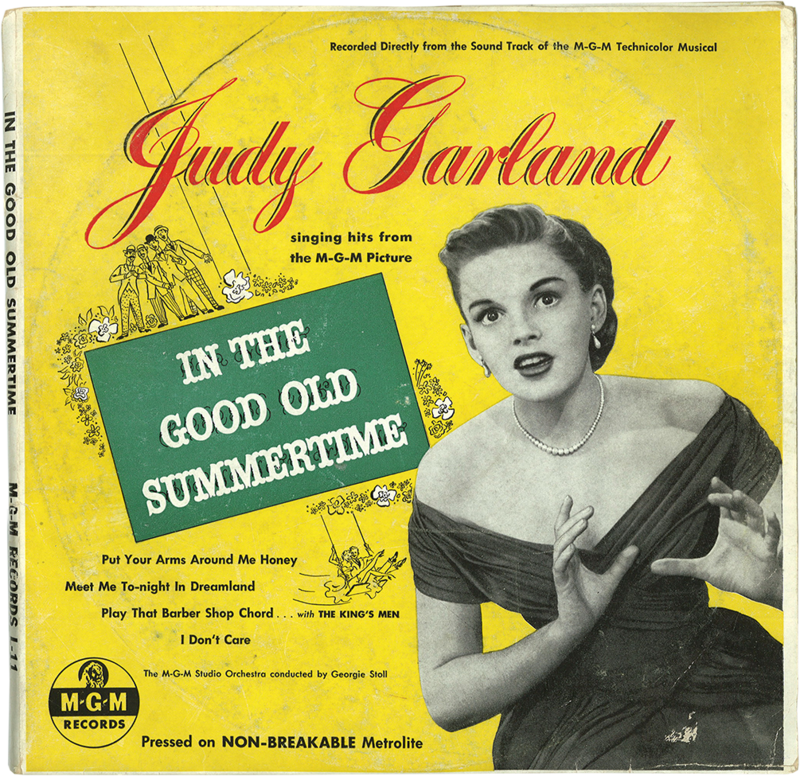 Check out The Judy Room’s Filmography Pages on “In The Good Old Summertime” here. Download the original MGM Records version of the soundtrack here (zip file). 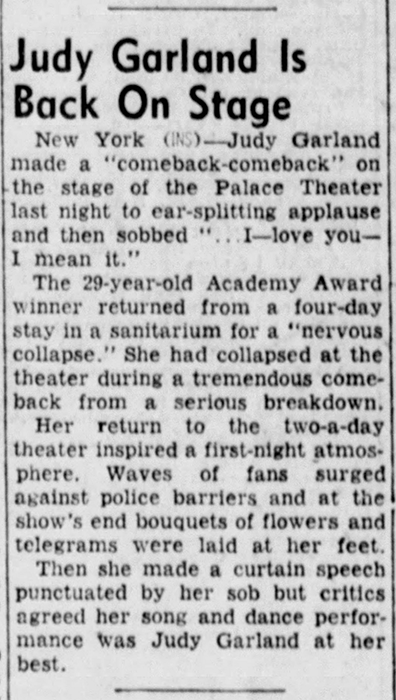 November 16, 1951: Judy returned to The Palace Theatre in New York. She had been out since November 11th due to a physical collapse brought on by her overworking herself. 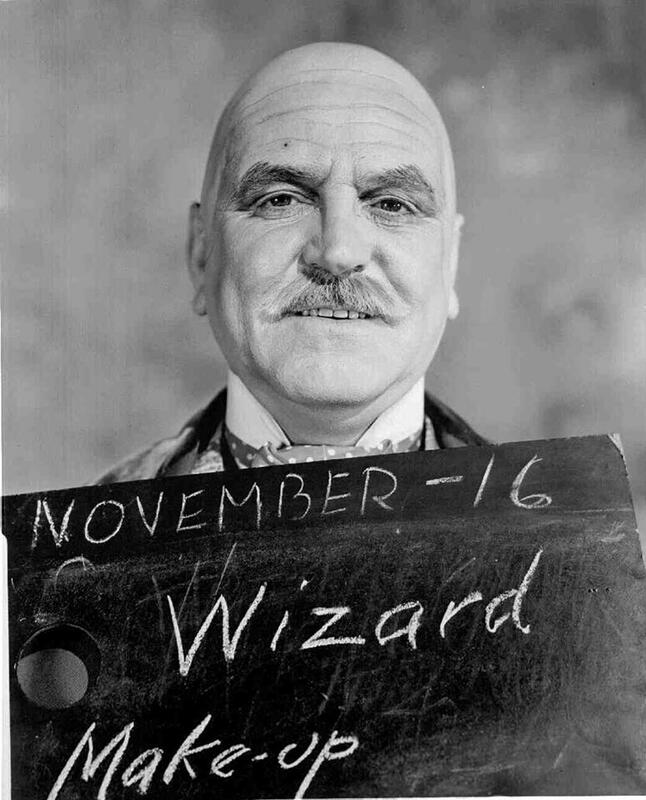 November 16, 1953: The first of three days of filming on the “Exterior Rooming House and Roof, ” “Exterior Boarding House,” “Exterior Rooming House and Street,” and “Exterior Oleander Arms” locations for A Star Is Born. All of this was on location in Los Angeles. 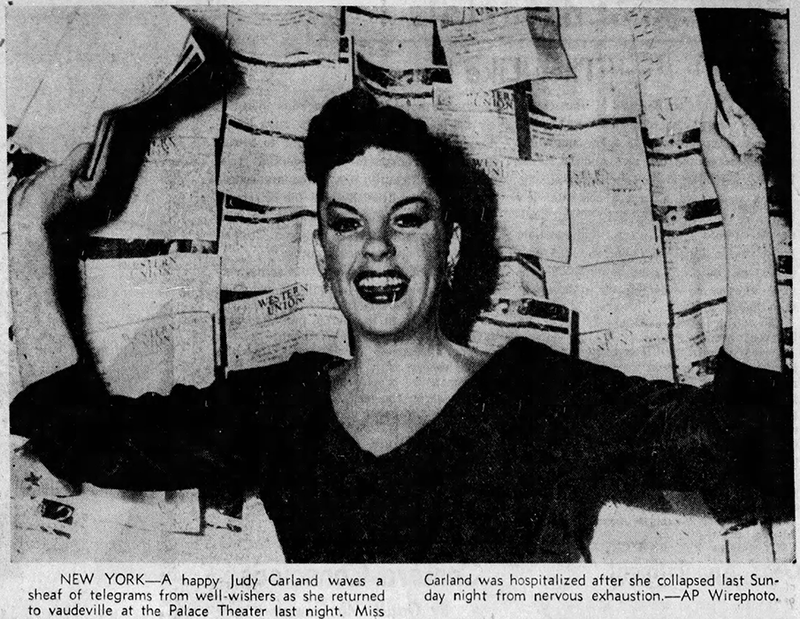 Each day began at 10 a.m. and ended anywhere between 4:50 and 5:45 p.m.
November 16, 1957: Judy’s last shows (an evening and a matinee) at the Dominion Theater in London, England, took place on this date. Judy delighted the audience by repeating “A Couple of Swells” as one of her encores. 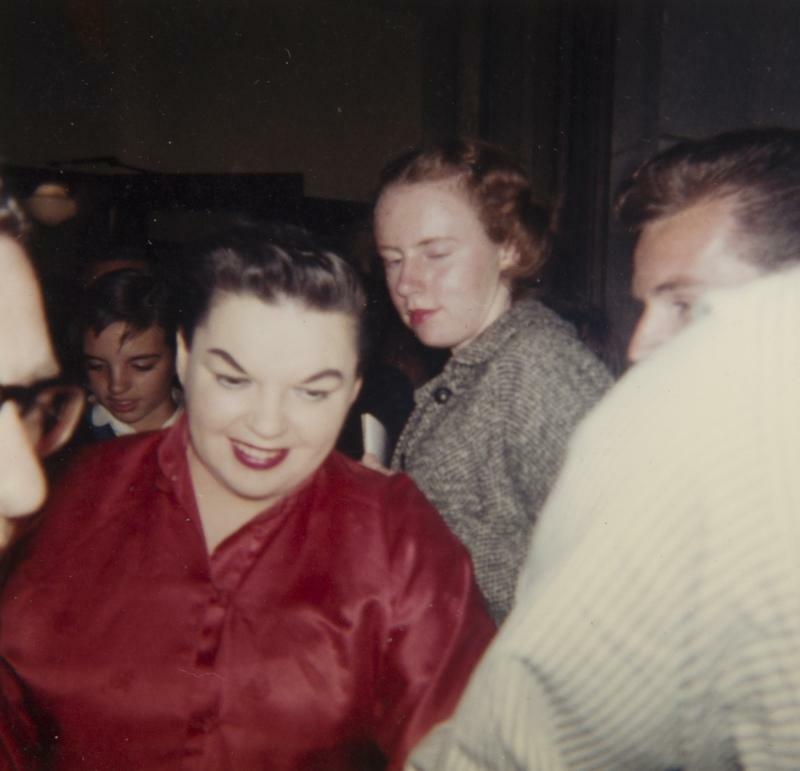 Photos: Two snapshots of Judy and daughter Liza Minnelli in London in 1957. November 16, 1968: While still at the Leroy Hospital in New York, Judy was visited by her hairdresser, Gene, of Bendel’s of New York City, who gave her a haircut and touchup. 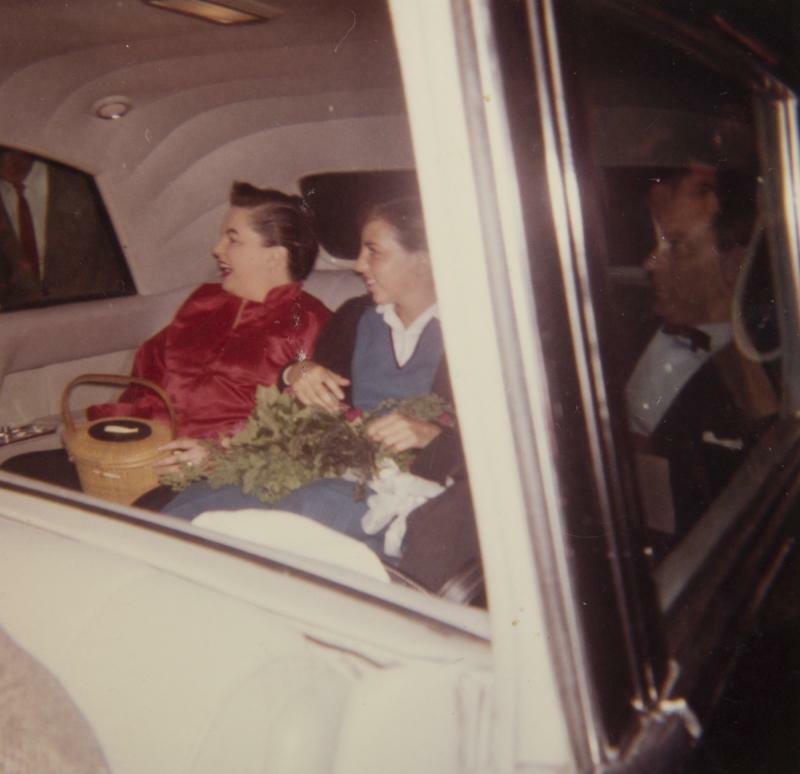 The gray streaks were gone, and Judy’s hair was “the color of charcoal.” Judy was then granted a leave from the hospital to have dinner with John Meyer and his parents. Meyer picker her up at 7 m., and that evening (and in spite of her injured foot) just before they dined Judy recreated the dance she did in “Lose That Long Face” which had been cut from A Star Is Born. 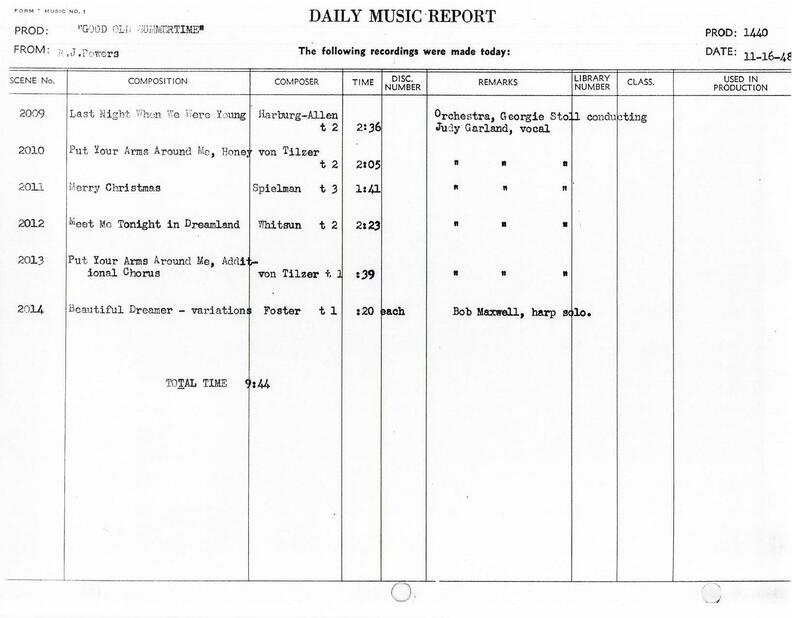 Interesting that Judy recorded ALL those songs for “Summertime” in one day! For me, this is one of her little “Miracle Films” (and #5 in my top twenty). She never really sang in that “40’s sound”, or had that “40’s” loveliness again, although she attempted to duplicate it in several of her Capitol Albums (still beautiful in voice, but a much deeper sound). Last Night While We Were Young: I far prefer this version to Judy’s 1956 take, but I feel this is the worst visually of her cut numbers. Not only is she too overwrought in her performance, but the number is so sloppily staged (plopping down on the bed, then back up again). How much nicer it would’ve been to see Judy quietly roam the room, glancing out the window at the snow, or holding a tiny Christmas toy, doll – anything! I love the recording itself, but I’m glad it was cut. It also would’ve dragged the film down. 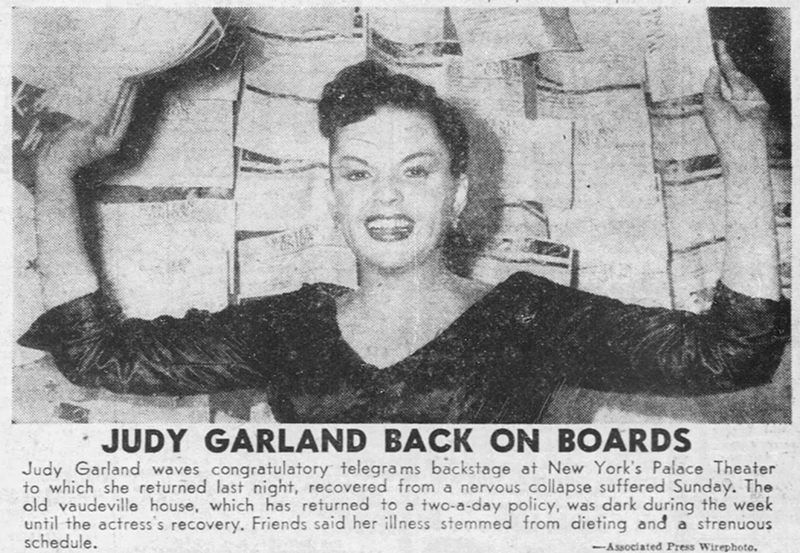 Honestly, I enjoy “In The Good Old Summertime” much more than “Easter Parade.” Judy’s extra weight makes her look so much healthier and she seems much sturdier not just from the weight but from being in better overall health. And her voice is so wonderful, as you mention. I like both versions of “Last Night When We Were Young.” And you’re right, the outtake footage is so emotional. I enjoy it, but I think they were wise to cut it because on a big screen it would have probably been too much for audiences, especially in light of the film’s breezy comedy to have this hit them – WHAM – almost out of nowhere.